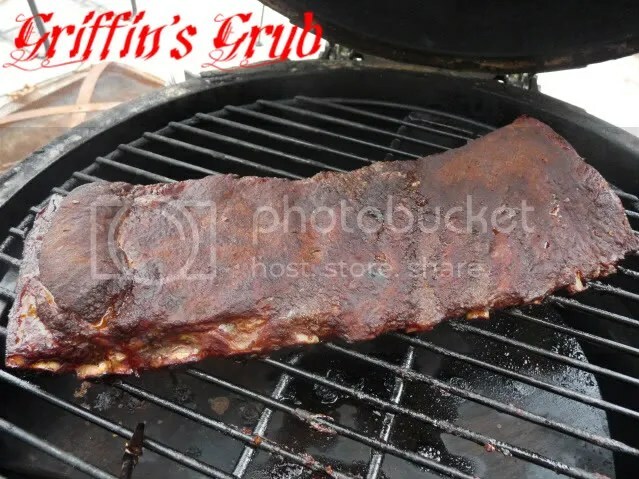 I had the day off yesterday for MLK and I thought what a perfect day to try out my new pit controller that I got for Christmas on a rack of ribs. For those of you who don’t know, a pit controller does exactly what it sounds like….controls the temperature of your pit. There is a temperature probe that goes inside your pit. 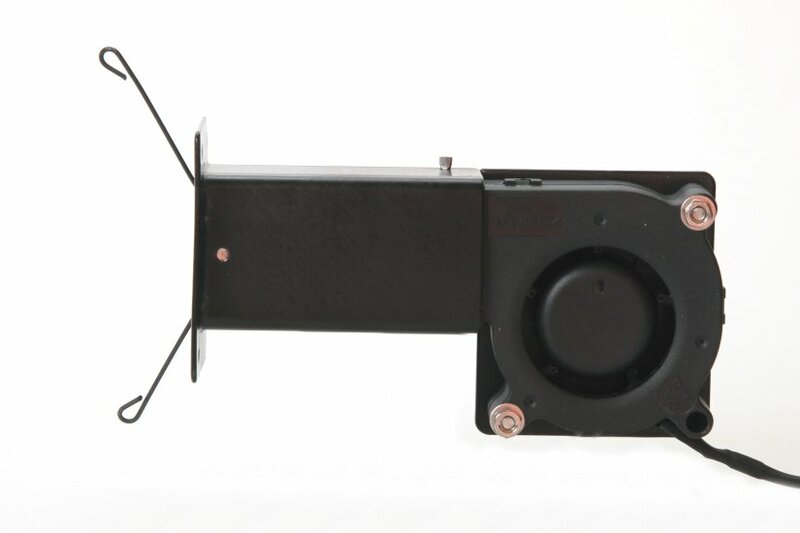 When it senses the temperature of your pit is falling below your pre-set temperature, it kicks on a small blower similar to one you might find on a computer. The blower directs air over your coals, stoking the fire and increasing the temperature until it reaches a set point and then shuts off. 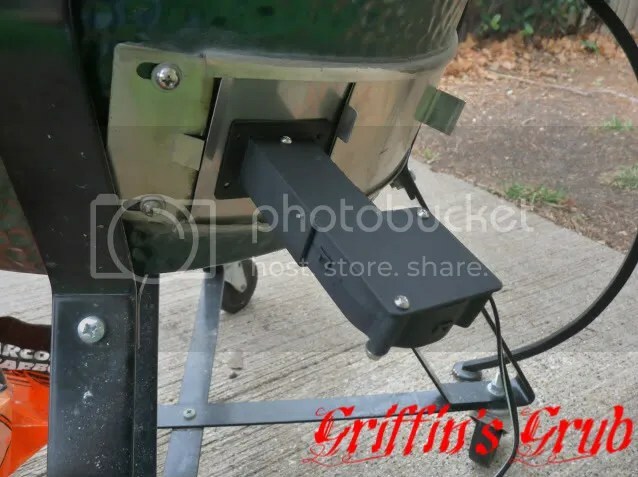 BBQ has entered the 21st Century and become electronic and computerized! This is the blower that will help to regulate the temperature in your pit by forcing air across your coals and stoking the fire. Notice the spring wire on the left had side. This will slide into the vent on your pit and hold the blower in place. In the above picture, you can see how the fan connects to the BGE over the bottom vent. There is a small adaptor plate that fits on the vent and then the blower is held against that plate by the spring wire. If you look closely at the adaptor plate, you will see that at one end there is a little bend. I actually installed that wrong and the bend should go in, not out like I have it. The way I have it, there is a gap that allowed air to flow into the vent. I did reverse it as soon as I took that picture and realized it. Oops. I will say that the instructions that come with the Auber Instruments are somewhat lacking. While it does cover how the controller works and how to set alarms, it does not go give any directions on how to use it with whatever type of pit you might be using. How do I set the top vent? Do I use The DFMT at all? If so, open all the way, or partially closed? If I am using a placesetter, do I put it in the egg and allow it to come up to temperature before turning on the controller? Or do I throw it in cold, plug in the controller and let it bring it up to temperature? I guess I’m going to have to play around with it and figure it out myself, unless somebody out there wants to give me some pointers. For this cook, I let the egg come up to temp and then stabilize at 250. I then added the placesetter legs down and the grate on top of that. I clipped on the remote temperature probe to the grate. I waited another 15-20 minutes for the Egg to warm up the platesetter before plugging the pit controller in. 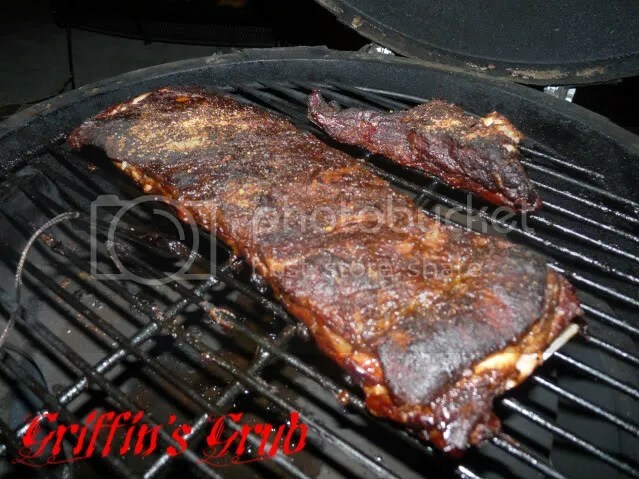 For the ribs, I took a rack of spare ribs and trimmed then down St. Louis style. I then slathered them with mustard and applied a rub I received from my Secret Santa Booking It on www.greeneggers.com called Bronzeville Rib Rub from The Spice House in Chicago. 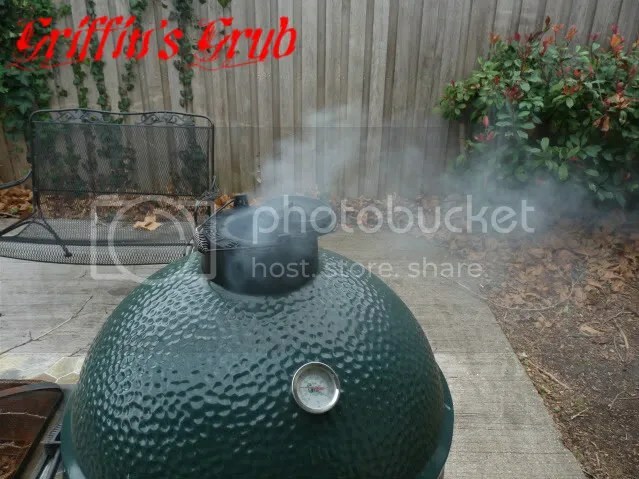 After 3 hours, I removed the ribs from the Egg, wrapped them in aluminum foil along with some beer and some butter, then returned them to the smoker for another 2 hours. After spending 2 hours in foil, I removed the ribs from the foil and placed them back on the Egg to finish up. 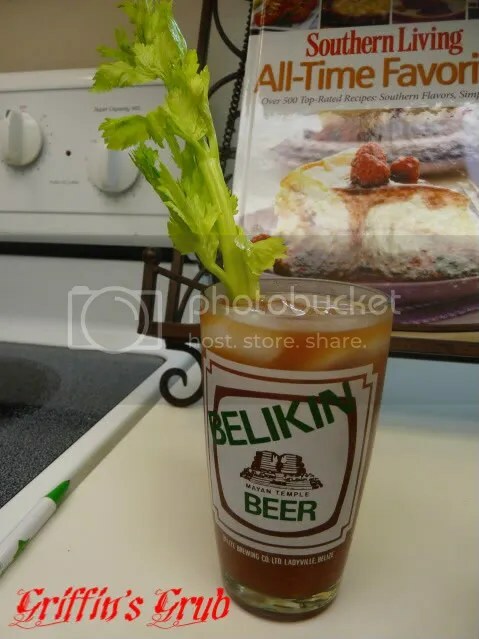 While I was waiting for them, I thought a little bloody mary might be nice. 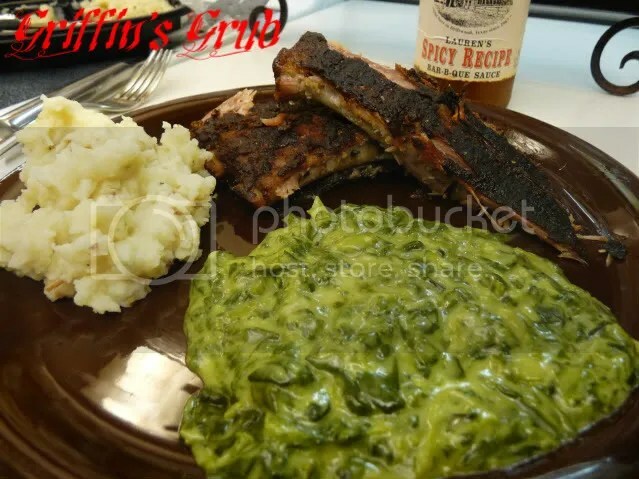 We plated up the ribs with some creamed spinach with Asiago cheese and loaded mashed potatoes. 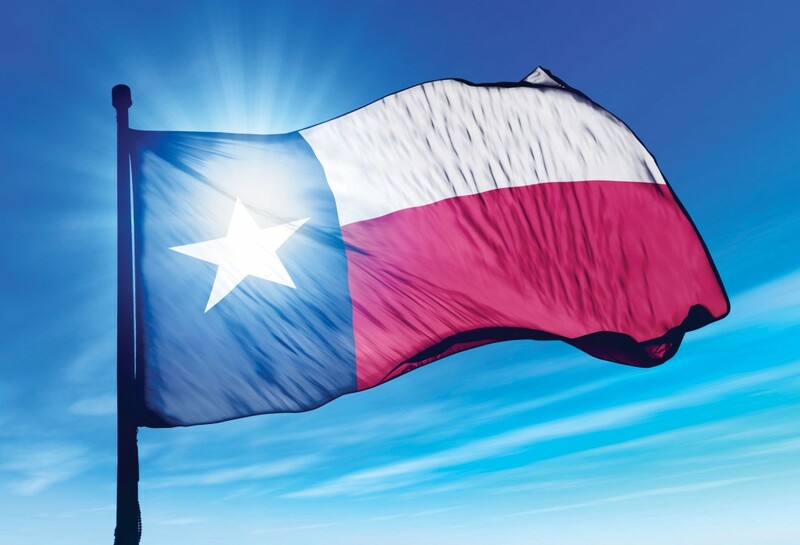 I will admit, that the sides were pre-made from Tom Thumb and were the kind you just nuke, but I knew Mrs. G was going to be getting home late at an undetermined hour, so I couldn’t plan on when the sides would be ready. I figured she would be ready to eat as soon as she got home and wouldn’t want to wait and make something then. Sometimes, easy and quick is better. 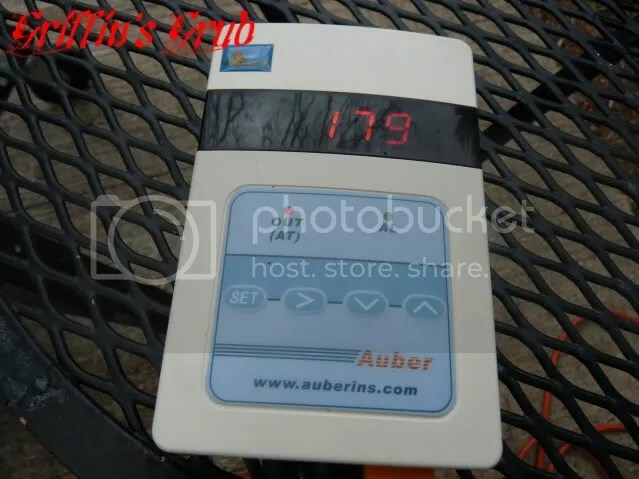 So what are my impressions of the Auber Instrument Pit Controller? It is a reasonably priced entry-level pit controller (I didn’t want one of the fancy ones with all the bells and whistles). Seems like it is nicely built. The numbers are easy to read and it’s not too difficult to set. The fan is quiet when it kicks on (I could barely hear it over all the wind we had yesterday). My temperature never dropped below the 250 I had it set for, so that works. I do wish it had instructions for how to use with it with different types of pits. I guess I’ll just have to play with it some more and figure it out myself. Also, I wish they still included the gasket that seals the blower to the adaptor plate (the review The Naked Whiz did on his website mentions one), but apparently they quit including that from what the tech guy told me. I might try to call back and see if I can get one anyway. It seemed like it wasn’t really an airtight fit without it. 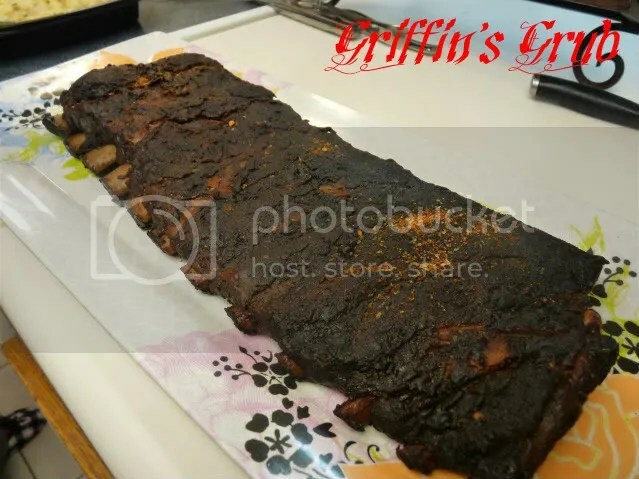 As for how the ribs came out…..not so great. They had a nice texture and weren’t dried out, but we did not care for the rub at all. It was way too salty and this is coming from a guy who adds salt to just about everything. It felt like my tongue had taken a swim in the Salt Lake. 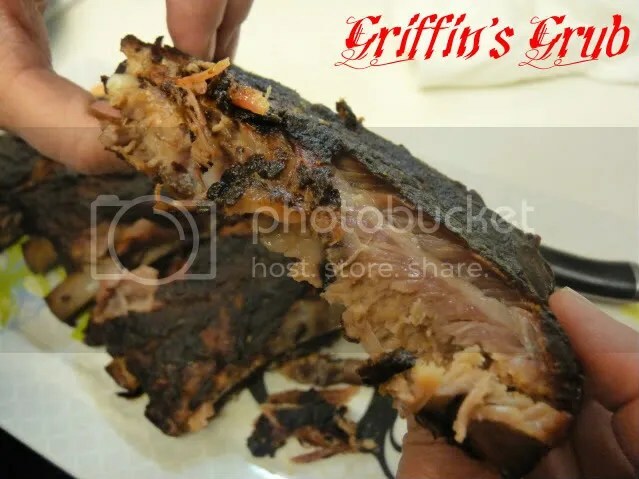 I don’t know if this is how people in Chicago like their ribs or just the way The Spice House does it, but I couldn’t get over it. 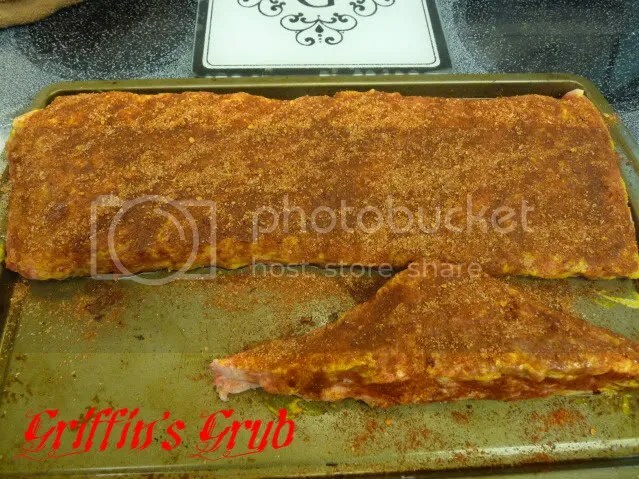 I so wanted to like this rub, but it ruined the ribs for me. I won’t be using this rub ever again. So far, two of the three rubs my Secret Santa gave me were good, but not this one. No problem. When I was looking around for a entry level pit controller, there wasn’t much info, except for The Naked Whiz’s website. So as I use it more and learn about it more, I’ll keep updating about it so more people can become familiar with it. My neighbor is pretty happy with his too. I might get one of these or the Party Q but just haven’t pulled the trigger yet. That creamed spinach looks enticing to me.